MSPV43 4. 1/3 Oit. A2-C7. Lâminas: Padouk 58-40 mm. Afinação A: 442 Hz. Frame: Voyager. Largura: 185 cm. Topo Grave: 90 cm. Topo Agudo: 40 cm. Altura Ajustável: 85-105 cm. Adams' Concert and Solist Marimbas. The Adams Concert and Solist Marimbas offer the precision construction methods and many of the great features found on Artist series instruments. And combine them with a number of keyboards and size options ideal for school, band and orchestra’s. Booth models are available in African Padouk, Honduras Rosewood. The concert model is also available in Zelon. Padouk is a very good sounding wood with a clear pitch. Affordable priced instruments with all options musicians want to play on. 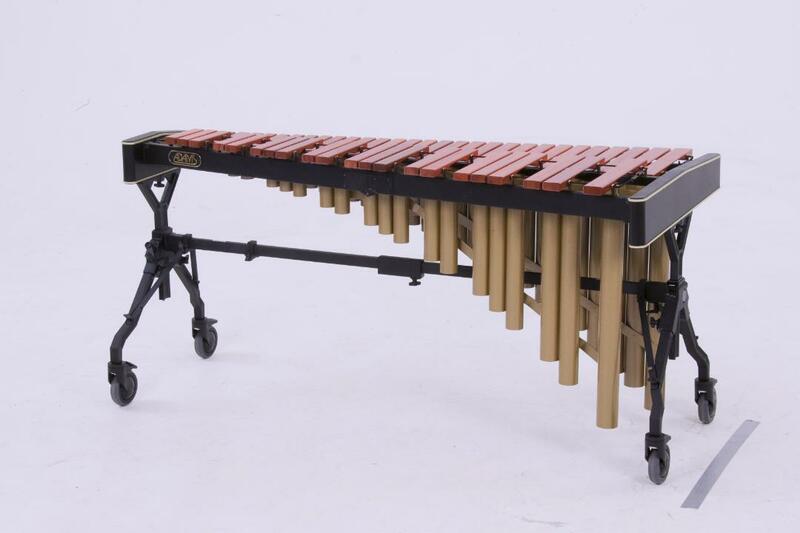 Solist Marimbas are available in 41/3 octave, 4 octave and 3 octave. How can you interest beginning percussionist in melodic percussion? The answer is the Junior marimba. The bar with is the same as all solist series, but the frame adjust to a lower height to allow the young beginner to enjoy Adams quality and craftsmanship. Concert and Solist models with Honduras rosewood providing maximum volume, sustain and clarity, based on the experience from all Artist models. Zelon is a synthetic material special designed for outdoor use and is also a good option for music schools. Adams Solist Series Marimbas: Adams Solist Series Marimbas offer the precision construction methods and great features found on Adams Artist and Concert series instruments, combined with a number of keyboards and size options ideal for beginners and schools looking for a high quality, wood bar instrument, at an extremely affordable price. When purchasing a Solist Series instrument, you have a choice between prime Honduras Rosewood bars or Adams extremely economical African Padouk wood bars. Padouk wood bars offer an excellent alternative to Rosewood, by producing a beautifully warm, woody sound, at a fraction of the Rosewood's cost. Adams was the first manufacturer to offer a truly high quality, wood bar student instrument, and Padouk wood bars are available on both Adams 41/3 octave Solist Series marimba, and Adams 4 and 3 octave Solist Series Marimba. Unlike other student model marimbas, all of the bars within Adams Solist Series are graduated in width. They’re slightly narrower than Adams Concert Series bars, specifically designed to allow easier mallet spreads for beginning players. PSM 510 African Padouk C2-C7 , 71 - 40 mm 5 Oit.